We present a methodology for the composition of rich services that exhibit temporal uncertainty and complex task dependencies. Our multi-agent approach incorporates temporal and stochastic planning paradigms and commitment-based negotiation to achieve coordinated provision of services with stochastic outcomes. This is all captured within a service-choreography protocol, by which agents can request services and receive probabilistic temporal service promises, to iteratively converge on coordinated behavior. 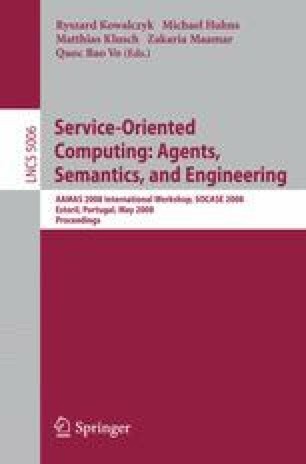 We argue that such an approach partially decouples the problems of negotiating service interactions and computing service policies, so as to more efficiently converge on good solutions.